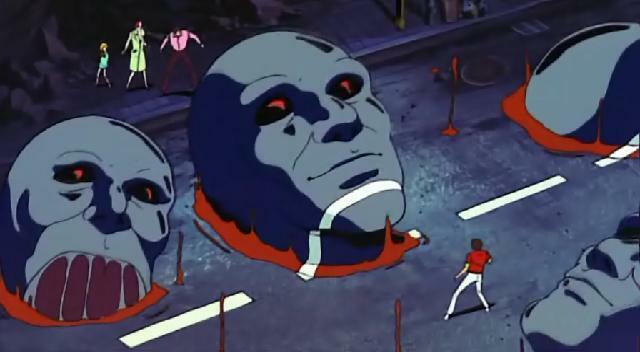 Upon request from the Anime World Order Podcast, Evan and David decided to watch the 1986 anime film Ai City, which is a tremendous mess of 1980s anime tropes and unintelligible storytelling. And to help with the brain-melting task of interpreting Ai City, they brought along their college buddy Stephen. For better or for worse, this podcast accurately reflects the experience of sitting in a dorm room with the three of us talking about an awful '80s anime. Before we get into Ai City, though, we discuss Fate: Grand Order, Dishonored, and Drifters. And in the questions segment, Evan gives tips on how to learn more about animation technique in anime. Topics include: being eaten alive by rats in your own bathroom, psychic power plays, and giant floating heads. David got tricked into playing Fate: Grand Order (fan wiki here) and now he's hooked. Stephen is watching Drifters . Baka-Updates entry for SYUFO, the author of the original Ai City manga. There's a video on YouTube of just the fight from Ai City featuring with the greatest song ever written. Check out the other reviews of Ai City from our friends at Anime World Order and Dave & Joel's Fast Karate for the Gentleman. For fans interested in learning about animation in anime, check out AniPages, Sakuga Blog, SakugaBooru, and sakuga MADs on YouTube. And read Evan's new article in Otaku USA! Evan writes for Otaku USA Magazine, and contributed a feature about sakuga fandom to the new Anime USA special issue. Evan was a guest on the Crunchycast, the podcast he used to host on Crunchyroll.